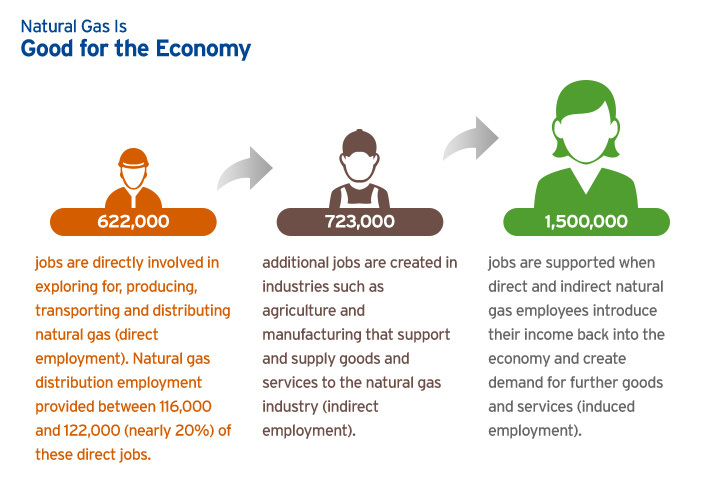 Learn about the beneficial effects that natural gas has on local economy and job creation. Natural gas is clean, affordable, abundant and domestic. All of these qualities make it a great choice for California's long-term future. Today, natural gas adds more than $36 billion to the state's annual economy and supports a quarter of a million good-paying jobs. By 2035, natural gas production is expected to contribute $3.3 billion in annual wages to California workers.1 In the U.S. as a whole, the natural gas industry employs people in all 50 states – supporting direct, indirect and induced jobs. With natural gas, we can clean up our air and build the economy. It's a win-win. Households that use natural gas for heating, water heating, cooking and clothes drying save an average of $693 per year compared to homes using electricity for those applications.2 That $693 represents the average amount of extra disposable income delivered to every American household each year through 2015 as a result of low natural gas prices. Businesses, both commercial and industrial, can save when they transition to the use of natural gas. In 2012, the average commercial customer saved nearly $2,500 on his/her annual energy bill due to low natural gas prices, compared to 2008. With natural gas we can clean up our air and build the economy.